Developer Joel Cochran recently made the switch to a standing desk. Like our round-up of DIYers who put together standing desks made from found objects, Joel initially used a sturdy cardboard fruit box as a desk-top stand for his laptop, mouse, and a coffee cup. He tried standing for at least half of every day for five days and at the end of that time, he felt great. At that point, he was totally sold on the idea and committed to investing in a commercial standing desk. After a little research, Joel decided that the healthiest choice would be an adjustable desk – one that he could either stand or sit at. And he wanted one he didn’t have to hand-crank, which meant he’d have to choose an electrical one. In the end, Joel chose UpDesk’s PowerUp desk, in the largest available size (72” by 30”), and he’s very pleased with his purchase. In fact, he has nothing negative to say about it. UpDesk provides some fun and helpful videos (including one that guides you through assembly and installation). Joel was also really impressed when he emailed the company and got a response from a real person within 30 minutes. 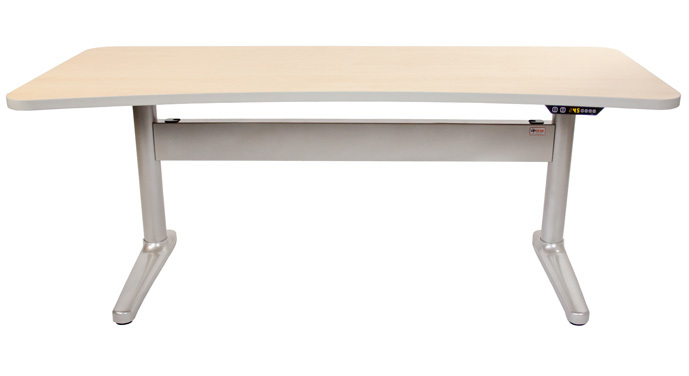 Joel’s large PowerUp desk cost him less than $1000 and only $139 in shipping costs. And he says that the hand-crank versions are hundreds of dollars cheaper. Joel says the PowerUp was easy to put together, especially since UpDesk provides an excellent video that walks you through the entire installation process. He put it together in about an hour, using manual tools. Joel’s Verdict: If you’re looking for an attractive and reasonably priced standing desk that you can adjust at the touch of a button, the UpDesk PowerUp is the one for you.